Dental hygienists clean teeth and examine oral areas, head, and neck for signs of oral disease. May educate patients on oral hygiene, take and develop X-rays, or apply fluoride or sealants. Perform dental assessment of patients, e.g. by examining gums for sores and signs of disease. Expose and develop dental x-rays. Clean teeth and gums, e.g. by removing deposits or stains and polishing teeth. 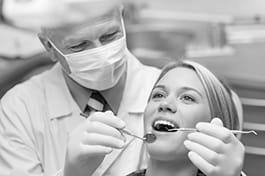 Perform preventative dental procedures, such as fluoride treatments and applying sealants to fissures. Educate and advise patients on dental health, plaque control, oral hygiene and nutrition. Apply local anaesthetic for dental procedures. Make impressions of patients' mouths for the construction of study casts and mouth guards. Assist dentists with procedures and treatments, e.g. by polishing tooth restorations. Assist in the prevention and control of dental caries and gum disease. Apply and remove periodontal packs and assist in periodontal disease control. Apply preventive and prophylactic substances, such as sealants and fluoride, to the teeth according to the dentist`s directions and under the dentist` supervision. Educate patients on improving oral healthcare and preventing dental diseases, promoting brushing, flossing, and all other aspects of dental care according to the dentist`s directions and under the dentist`s supervision. Maintain metal, gold and amalgam dental restorations by polishing in order to mitigate the effects of surface corrosion and maintain the esthetic appearance of the restoration according to the dentist`s directions and under the dentist`s supervision. Remove calculus, plaque, and stains from all surfaces of the teeth according to the dentist`s directions and under the dentist`s supervision. Evaluate the outcome of a dental hygiene intervention using indices, instruments, examination techniques, and feedback from the patient and others in order to improve patient health according to the directions and supervision of the dentist. Take and develop dental radiographs or x-rays for patients, by properly positioning the patient and film/image receptor to take intra- and extra-oral radiographs, applying all regulations for patient safety (shielding, operator protection, beam collimation). Create a dental chart of the patient`s mouth in order to provide information on tooth decay, cavities, missing teeth, the depths of gum pockets, abnormalities in teeth such as rotations, erosion or abrasions in the teeth or enamel, damage to teeth, or the presence of prosthetic teeth according to the dentist`s directions and under the dentist`s supervision. Intervene in dental hygiene to eliminate and control local etiologic factors, in order to prevent caries, periodontal diseases and other oral conditions, or control them when they occur according to the dentist`s directions and under the dentist`s supervision. Work directly with dentists by following their detailed instuctions.